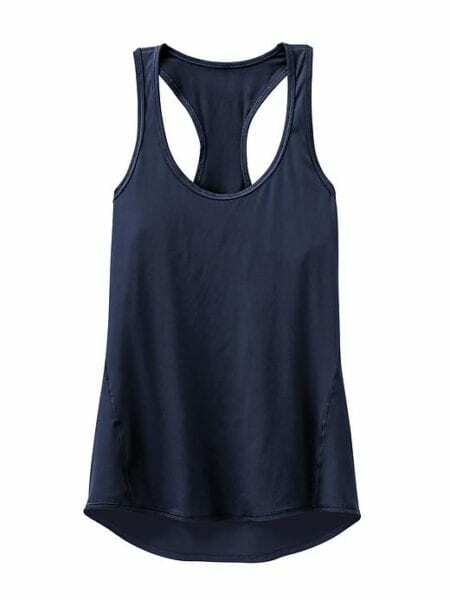 The Athleta Chi Tank is an athletic tank top that features a soft, buttery fabric that is breathable and moisture wicking. The fabric combo of Polyester and Lycra® Spandex delivers performance without looking or feeling like a tech fabric. The Chi Tank, in my opinion, falls into the multi-functional tank category. These types of tanks are a mainstay for summer months and travel as you can wear them on a sunny-warm day for casual attire, to yoga at a local park, to the gym, and on a run. I tested out the Chi Tank in Blossom Print (featured below). The photo above is the Chi Tank in Tropea. The tank is available in a variety of prints and solids to match your tastes. The Blossom Print is definitely more stylish than my traditional solid colored workout gear. 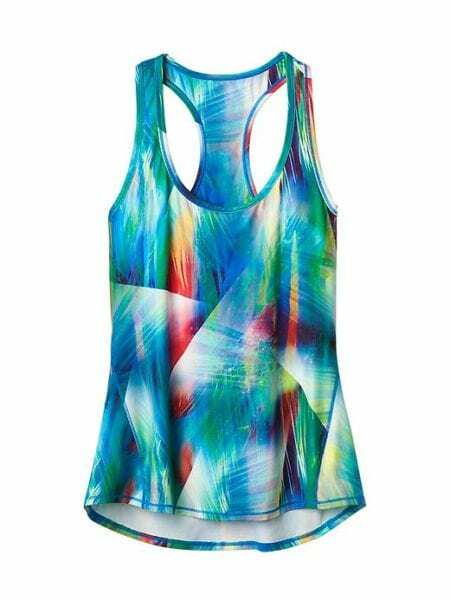 The Athleta Chi Tank features a semi fitted, drop tail, racer back design. In layman’s terms, the back of the tank has a 27″ length, which is longer than the front length of 25.5″. The front of the tank features a lower scoop for “layering over pop color bras”. I am a bit modest when it comes to working out and felt the lower scoop wasn’t my style, but that’s a personal preference. Based on the size guide I fall between a size small and medium. I tested the tank in a size medium because I prefer a loose fitting tank when working out. Sizing down to a small, I likely would have eliminated some of the gaping I felt with the added scoop neck. If you like loose fitting tanks, order a size up with the Chi Tank. Polygiene is a stand alone brand that partners with various companies to allow its’ users the benefits of “Wear More, Wash Less” fabrics. Sweat by itself does not smell, it is the bacteria and fungi that proliferate on the sweaty fabric that creates the unwanted smells. Polygiene prevents the growth of these odor causing organisms by adding small concentrations of silver salt that is obtained from the recycling of silver. Silver has natural anti-microbial properties. As a medical person, we often utilize silver dressings to cover wounds or surgical incisions to help prevent or fight infections. The silver salt is added to the fabric during its’ final stages of production and lasts the lifetime of the product. The goal of the technology is that by decreasing the amount of odor in a fabric the wearer can wear the product over and over without having to wash it. This equates to less wear and tear on the fabric, the ability to wear an item multiple times to safe space when traveling, and improve your social acceptance. That last one is kind of a joke, but in all honesty, who wants to sit by someone who’s shirt you can smell from a block away? 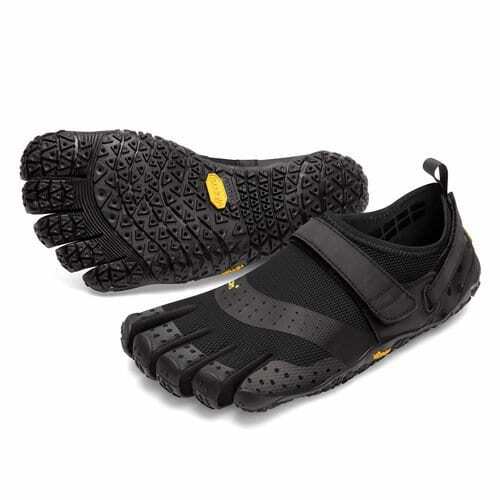 I’ve owned base-layers with Polygiene and have successfully worn them 2 weeks at a time without washing them. I’ve had these garments for about 2 years now and feel that the Polygiene is still doing its’ job. 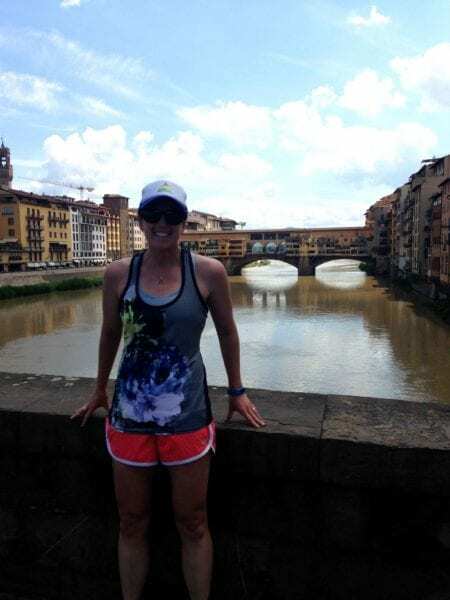 I tested this out with Athleta’s Chi Tank on a trip to Italy in the spring. I successfully wore this top 4 times, both casually and while running to see the sights of Florence. Polygiene has partnered with many companies, including a few of our favorites: Patagonia, Arcteryx, Polartec, Dakine, La Sportiva, Dynafit, Salewa, Giro, Inov8, Outdoor Research, Eddie Bauer, Toad&Co, Simms, and Nathan. And if that weren’t enough to convince you to look for products with Polygiene, they are also bluesign® approved, meaning the have the highest certification for sustainability in the textile industry. 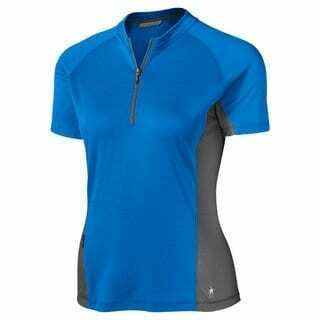 Here’s a link to the Patagonia base-layer combo mentioned above. The review landed on Polygiene’s homepage last year: Patagonia Capilene 4 Pro Half Zip and Bottom.